FPB 78-2 has emerged from the berthing shed at Circa. 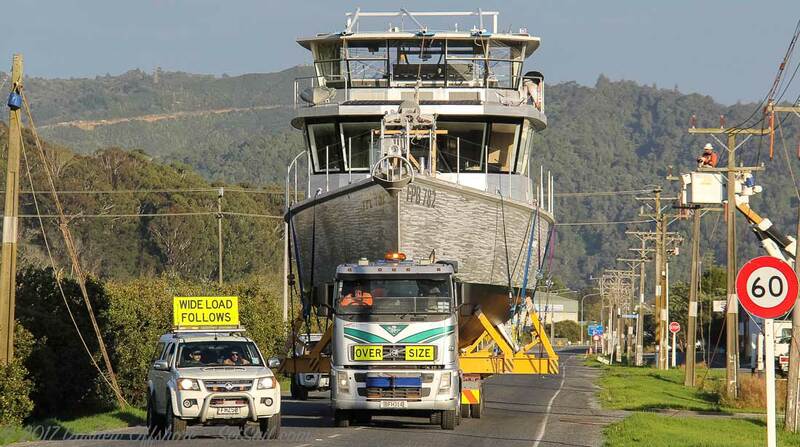 The 15th FPB is headed down the road for launching and initial tests starting tomorrow. This entry was posted on Tuesday, February 28th, 2017 at 1:41 pm and is filed under Dashew Logs, FPB 78, The Logs. Both comments and pings are currently closed. Just looking at the pictures made my heart race a bit…so I can’t imagine how excited the owners must be. Live long and prosper FPB 782. Do they have to drop powerlines every time they launch a boat? Yes, power lines come down with each launch. You mean if I get one I can’t tow it with my Chevy? You can see a guy in a cherry picker moving/checking the utility lines. I don’t remember this front angle on the post of 78-1 being moved, but the width of that trailer is impressive, looks like a good 20ft+. Can’t wait to see interior photos to see the difference in interior design. Any major difference in equipment from 78-1 to 78-2? Systems are essentially the same. Electronics are different, however. Wow. And I thought towing our Catalina 27 to the lake was an ordeal. Beautiful yacht. May many trouble free miles pass under her keel. I see that the new model has portholes is this now standard or a request by the owner? See detailed answer to Mark Heeley. They are available, but personally we find them uncovered so rarely that the associated ice risks are not worth taking. I don’t recall seeing zincs amid ship before. Are these new? Painted below the water line….what is the coating? PJ-coatings vary with use of the boat. We will have more on this later. Hull windows on #02. Not a typical Dashew design feature. Hull windows have their place on flush deck sailboats where we first used them in 1983. Wind Horse had them out of habit, but we found they were rarely uncovered. In port, at anchor, our dock shades were almost always down for privacy. In high latitudes they were down so you could sleep. 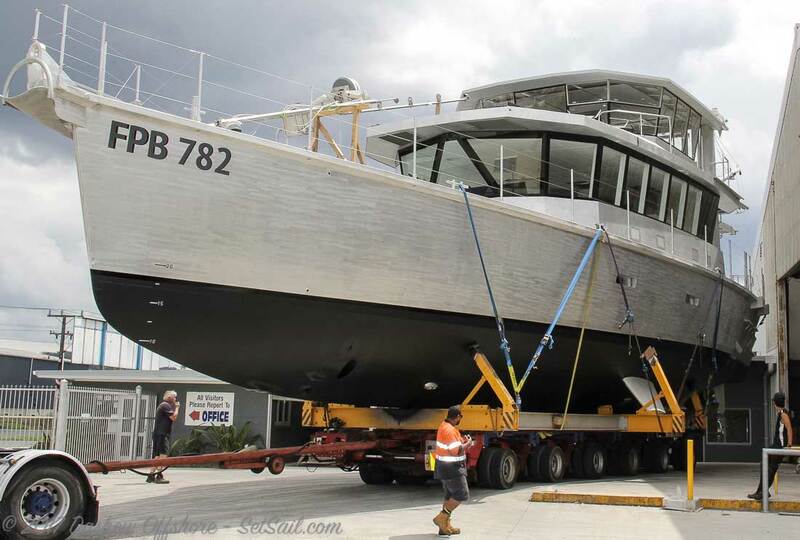 So what is the point of taking the risks – think iceberg projection, hooking the inset, and spinning the hull into an underwater projecting shelf – if they are only opened at the dock during boat shows and/or on rare real world occasions. They also interfere with the placement of art, which has no risks and is easily changed.